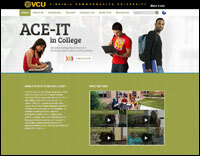 VCU's ACE-IT in College is an inclusive learning and training program for transition-age adults with intellectual disabilities. With individualized support, ACE-IT in College students participate in five semesters of employment, college classes, and campus activities. These college experiences create opportunity and prepare students to pursue self-determined futures. Funded by the U.S. Department of Education Office of Postsecondary Education, grant #881-APE62524-H027A170107. 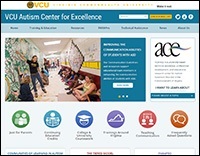 VCU-ACE is a university-based technical assistance, professional development, and educational research center for Autism Spectrum Disorder in the Commonwealth of Virginia. VCU-ACE improves services and supports for individuals with autism spectrum disorder (ASD) by promoting the implementation of research-based practices in schools and the community through training, technical assistance, research, and collaboration. Funded by the Virginia Department of Education Grant #881-APE61172-H027A170107. With over 30 years of experience, Business Connections at VCU bridges the gap between employers looking for qualified and reliable employees and a pool of prescreened job applicants with disabilities that have the proper supports in place for long-term success! Business Connections focuses heavily on understanding and meeting the specific needs of both jobseekers and employers to make the best job matches possible. It is the vision of the Virginia Department of Education to create a centralized statewide portal for information, resources, demonstration, and research for educators and other stakeholders in the transition of youth with disabilities. 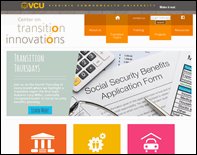 The Center on Transition Innovations (CTI) at Virginia Commonwealth University provides evidence-based resources and information along with emerging practices in the field. The results of research studies and demonstration projects conducted here in Virginia help us shape the ongoing work of CTI. Funded by the Virginia Department of Education contract #881-APE62524-H027A170107. Deployed 2 Work is a federally funded, randomized study for military connected or military dependent youth with Autism Spectrum Disorder (ASD). Participants are randomly selected to either receive vocational training within their current school setting or in a community-based internship program, Project SEARCH + ASD Supports, at Fort Eustis, VA. Congressionally Directed Medical Research Program (CDMRP) W81XWH-16-1-0707. The DRRP on Customized Employment of Individuals with Disabilities helps young people with intellectual and developmental disabilities, including autism spectrum disorder, to achieve competitive employment based on the individual's choices, interests and skills. 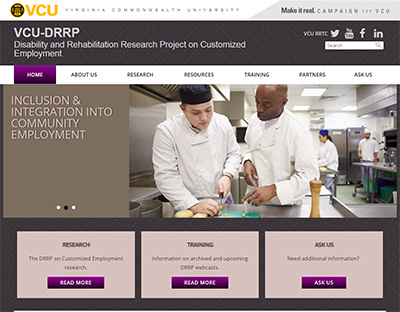 The DRRP project's overall objective is to test the effectiveness of customized employment as an intervention to facilitate employment for youth with disabilities. Customized employment can include job development or restructuring strategies that result in job responsibilities being customized and individually negotiated to fit the needs of individuals with a disability. Funded by the National Institute on Disability, Independent Living, and Rehabilitation Research (NIDILRR grant number #90DP0085). 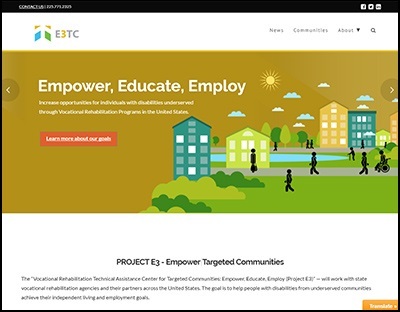 Project E3 is the Vocational Rehabilitation Technical Assistance Center for Targeted Communities. Project E3 works with state vocational rehabilitation agencies and their partners across the United States to help people with disabilities from underserved communities achieve their independent living and employment goals. VCU-RRTC partnered with Project E3's Knowledge Translation Team to develop strategies to take the latest research findings and apply it to current practices. U.S. Department of Education - H264F150003. 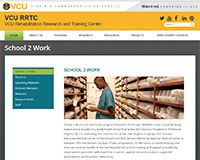 School 2 Work is an internship program, based on the Project SEARCH model, currently managed and evaluated in a randomized clinical trial at two Bon Secours Hospitals in Richmond, Virginia. VCU has replicated this intervention in two Virginia hospitals: Bon Secours Maryview Medical Center in Portsmouth and Bon Secours Memorial Regional Medical Center in Hanover. The intervention consists of two components: (1) 900 hours of onsite training over nine consecutive months at the host hospital site and (2) training and support provided by employment specialists with expertise in autism, applied behavior analysis, supported employment, and business networking. Funded by the National Institute on Disability, Independent Living, and Rehabilitation Research (NIDILRR grant number #90DP0051). 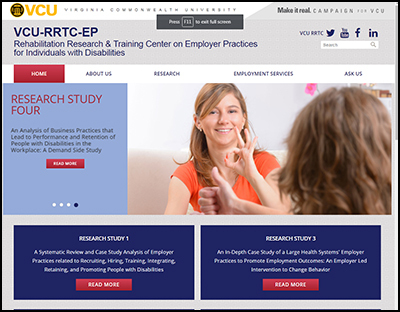 The Rehabilitation Research and Training Center on Employer Practices for Individuals with Disabilities. investigates the most successful business practices which companies utilize to hire and retain workers with disabilities. The project includes four studies, the largest and most significant takes place in partnership with Bon Secours Virginia Health System, a long term leader in diversity and hiring of persons with disabilities. In addition, VCU partners with researchers at the University of Wisconsin, Madison. Another research study involves working with up to 75 small, medium and large employers, including Conner Brothers Body Shop, Mango Salon and VCU Health. The studies' results are shared nationally and internationally through business trade meetings, journal articles, online trainings, conference presentations and social media. Funded by the National Institute on Disability, Independent Living, and Rehabilitation Research (NIDILRR grant #90RT5041). 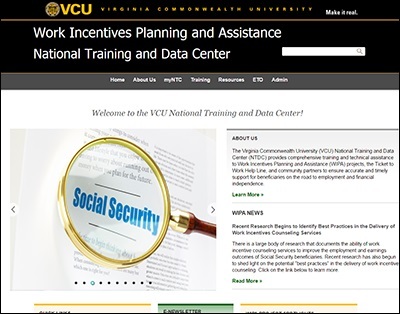 The Virginia Commonwealth University (VCU) National Training and Data Center (NTDC) provides comprehensive training and technical assistance to Work Incentives Planning and Assistance (WIPA) projects, the Ticket to Work Help Line, and community partners to ensure accurate and timely support for beneficiaries on the road to employment and financial independence. Funded by the the Social Security Administration (Contract #SS00-15-60034).